With the copious amount of food trucks rolling around Providence it makes it hard to decide which one to choose from. But if you saw a giant pink cupcake with massive multi colored sprinkles on wheels, chances are you’d stop. New up and coming baker, Emily Lauren, from Johnston purchased a hot pink cupcake shaped truck only four months ago from a former baker in Narragansett. The baker posted the truck on Craigslist and with much consideration Emily decided to jump on it. The truck originally was made in New York and traveled to Rhode Island where it will stay for good. Emily left her career as a medical assistant over a year ago with a degree from RIC to follow her passion of baking cupcakes. She has attempted to put her foot in the door with jobs at local cupcake shops and bakeries, all of which were never fulfilling her dream. Being able to sell her own cupcakes was a goal she wasn’t going to let slip away. Using events such as birthdays, weddings and baptisms and spreading the word through Facebook and social media Emily gave her business a name, Erms Cupcakes. 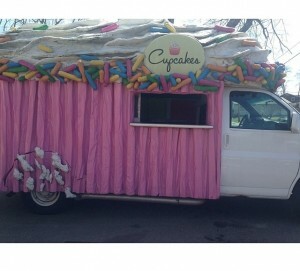 Erms Cupcakes are currently for sale in the pink cupcake truck in different locations around Johnston. The next few weeks she will be at the Johnston Memorial State Park. Although the truck hasn’t made it into the Providence area just yet, within the next few months Erms Cupcakes should be taking off into Providence and Cranston with more locations to be announced.